Yesterday we touched on the mob of Antifa thugs that showed up at the home of Fox News' Host Tucker Carlson's home and terrorized his wife, who was home alone, in order to show the vastly different coverage by the liberal media regarding an actual threat to a television pundit in comparison to the over abundance of coverage the MSM provided to CNN's Jim Acosta after his White House press pass was revoked when he refused to give up the microphone, and was generally obnoxious during a presidential press conference. More information has come to light regarding the Antifa mob action against Carlson, including the fact that the group, Smash Racism DC, had spray painted anarchist symbols on his driveway, posted his home address online, vandalized the vehicles in their driveway with signs, and broke his front door, while his wife was hiding in the pantry and calling the police. I got a bunch of texts from people, my neighbor saying something terrible is going on at your house. By the time I called my wife, [she] has the police and my brother there. I have a very large brother who lives a couple blocks away, thank heaven. We are close. He was there immediately. She’s standing in the kitchen waiting to go out to dinner, and people started pounding on the door, really hitting the door hard and screaming, threatening. She thought it was a home invasion. Carlson continued with his take on the "grotesque" actions of the mob of Antifa thugs, stating "One thing they did, I think the worst thing that they did, was they put my home address on the Internet and they put a poster right in front of my house with my home address on it and they filmed it. They taped it and they put the tape on the Internet. You know, I can’t have my kids stay home alone now. I’m a normal person, I live in a normal neighborhood." He is right, and the police report obtained by the Daily Caller, shows the D.C. Police are investigating the incident as a "anti-political hate crime." The liberal media outlets that did report on this generally referred to the Antifa mob as "protesters," which is a dishonest description in my mind, because they weren't just protesting, they were using intimidation and violence in pursuit of political aims, which is the text book definition of terrorism, not protest. Protesting and the right to "peaceably" assemble is a right guaranteed under the U.S. constitution, but violence and intimidation, especially against civilians, is illegal. That is not just my opinion, as Former New York City Police Commissioner Bernard Kerik told Breitbart News "In the most minimal definition of terrorism, it’s the unlawful use of violence and intimidation — especially against civilians — in pursuit of political aims. Antifa is a domestic terror group. I strongly believe that the FBI and the Department of Justice should classify them as such." Kerik also calls for a full investigation into who is funding these types of Antifa terror groups, stating "If the FBI and [Justice Department] got into [Antifa’s] background, started locking them up [and] interviewing them, somebody’s going to flip, and somebody’s going to tell you where they come from, where the money’s coming from, who’s funding the operation, who’s telling them to go out and do these acts of violence, threats, and intimidation. … If you look at the intelligence monitors and the people that capture the images of these people, many of them are the same people, which tells me that they’re being bused [and] transferred. They’re being paid. Somebody’s paying for this." Read and listen to Kerik's entire interview at Breitbart. As the news spread across social media about how Smash Racism DC Antifa group terrorized Carlson's wife, amazingly users from all political persuasions denounced the group for their abhorrent actions, with the far left liberal actress Alyssa Milano (known for her constant calls for gun control and dressing up as a hand maiden to protest the Kavanaugh confirmation hearings), saying "I don’t care what your political ideology is…this is not ok. Not. Ok."
Other liberals also offered condemnation over the Antifa terror tactics, along with conservatives, finally having something that pretty much everyone can agree with. Families should be left alone. A persons home, where their spouse and children live, should never be subject to threats and intimidation. It was pleasantly surprising to see something that conservatives, liberals, libertarians and Independents, could agree on, with the main themes being doxxing (publicly publishing private information) is wrong, no matter who does it, and who they do it to; Families of television personalities, politicians, etc... should be left alone, and; terror tactics are never acceptable. A quick note about Isaacson, who is a professor: He has a history of making statements on Twitter, such as "Reminder that if Trump does end up winning this stupid thing to assassinate Mike Pence *first*." He also once instructed his Twitter followers to "kill your local politicians." More about Isaacson over at PJ Media. Now, from people like that we expect a lack of empathy and a refusal to denounce terrorist tactics that they themselves promote, but what caused a real stir on social media was when Vox Media co-founder, Matthew Yglasias, decided to weigh in, mostly on the side of Antifa. 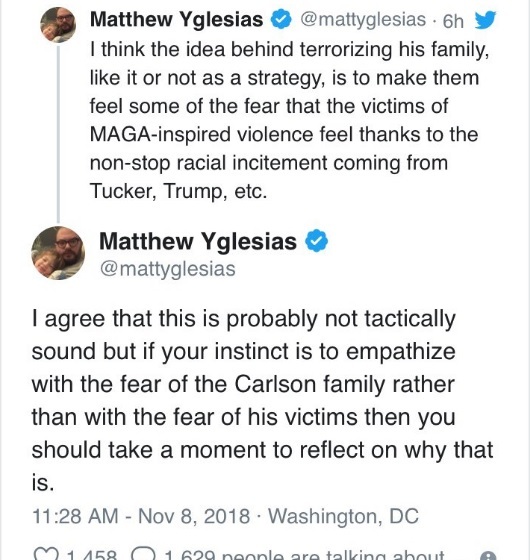 Since Yglesias apparently had no issue with the Antifa mobs terrorizing Carlson's family, nor publishing his home address online, many Twitter users, from the entire span of the political spectrum, moderate, conservative, liberal and Independent, pounced on him and his statements, in what his supporters called "dog-piling." Then someone doxxed him..... which, for the record is a horrible thing to do, whether it is Carlson, or Yglesias, and did Ygelsias attempt to clarify his remarks? No. He deleted his entire Twitter history, over 3,700 hundred tweets, instead. Now his account shows 66 tweets, and one rewteet of someone sympathetic to him for being doxxed, without even realizing her own hypocrisy in ignoring the fact that the entire controversy was started because the Antifa terrorists doxxed Carlson to begin with, which Yglesias felt no "empathy," over. Bet he is feeling it about now though! Another quick note, about Vox, via Breitbart: "Vox Media is backed by big corporate money, including Comcast-owned NBCUniversal to the tune of $200 million — an investment announced in 2015. 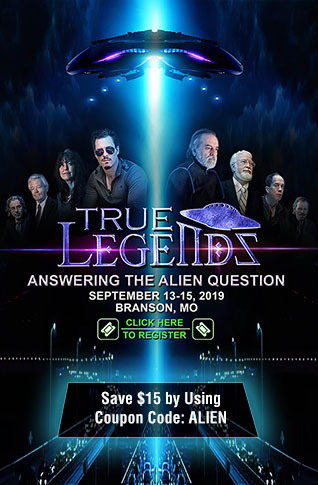 The company laid off 50 employees in February 2018." Yglesias also has over 412K followers on Twitter to which he basically just told that Antifa's actions were somehow justified. Antifa groups have for too long been allowed to violently disrupt conservative speakers at college campuses, have been been given free rein to take over the streets of Portland (video here), have been documented on camera as attacking peaceful protesters for no other reason than they disagree with their ideology. 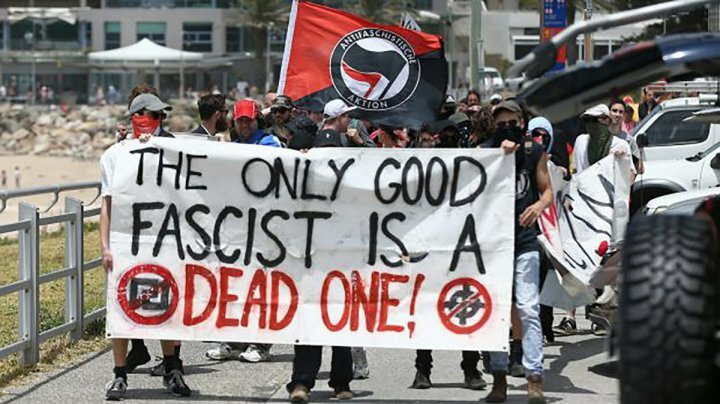 The majority of the time Antifa shows up anywhere, there is violence, vandalism, and terror tactics used by the groups that call themselves "anti-fascists," while using fascists tactics to silence others. They also tend to commit their crimes in liberal cities, where the law enforcement often stands back until the events end up as full blown riots. 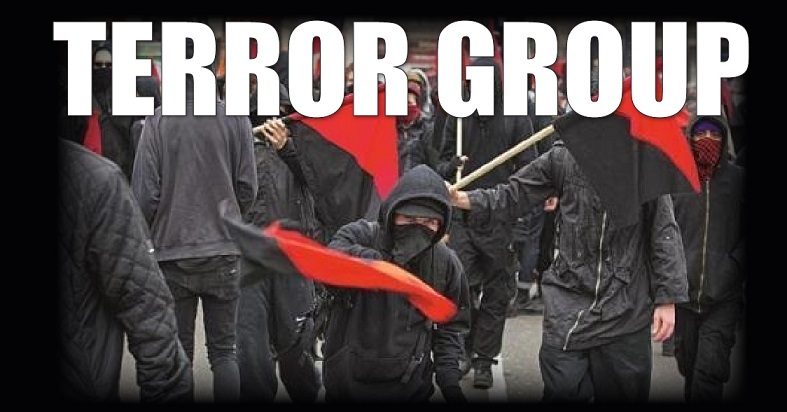 It is time for the U.S. government to finally declare these Antifa groups as domestic terrorists, which would then give federal authorities a chance to fully investigate, not only the crimes they commit, but who is ultimately funding them.